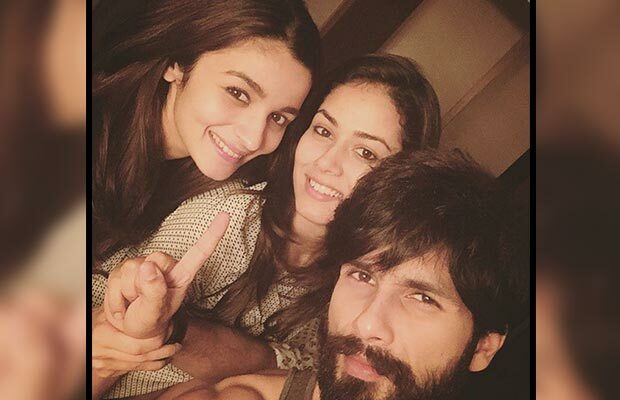 Shahid Kapoor's Shaandaar Selfie With Mira Rajput And Alia Bhatt! 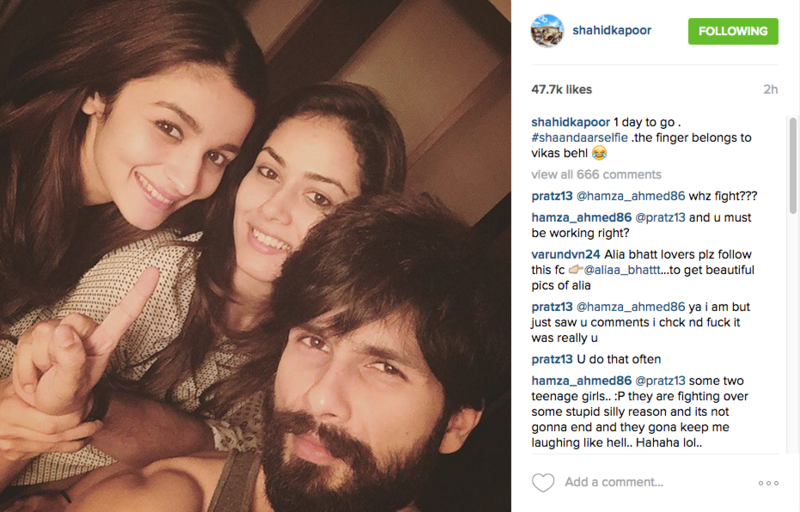 Home BOLLYWOOD Shahid Kapoor’s Shaandaar Selfie With Mira Rajput And Alia Bhatt! Bollywood’s two amazing stars Shahid Kapoor and Alia Bhatt are undoubtedly enjoying the promotions of their film ‘Shaandaar’. With the film releasing tomorrow, Shahid Kapoor’s wife Mira is also very excited about the film. Well, Shahid Kapoor has shared a very beautiful picture where Mira is seen in her bright smile, while the actor is seen in his intense beard look. With the movie releasing tomorrow, we are sure excitement among them is surely high to know what the film brings at the Box Office. Meanwhile, with one day to go, Shahid Kapoor and Alia Bhatt took the promotions of the film at Falguni Pathak’s garba festival in Mumbai yesterday. The duo was seen fresh and energetic while foot tapping on the indo-fusion version of ‘Gulaabo’ that was sang by Falguni yesterday. Shahid Kapoor also shared a video of him from the event where thousands of people are enchanting to see their favourite star. The actor also took a selfie with Alia Bhatt and Falguni Pathak. Loving the love . 2 days to go #shaandaarlove . Talking about Shaandaar, the film is based on Shahid and Alia who will be playing insomniacs and the film is of an Indian family who land up in an exotic location of London for the destination wedding, where Shahid Kapoor plays the role of a wedding planner. Also Read: Exclusive Bigg Boss 9 With Salman Khan: Guess Who Won The Lagaan Task? Also Read: Bigg Boss 9 Double Trouble: First Wild Card Entrant? Also Read: Bigg Boss 9 With Salman Khan: Finally You Will See Keith Sequeira And Mandana Karimi’s Ugly Fight! Previous articleWatch: One Direction With Their Perfect Music Video!